How to apply for a mortgage: Your 4-step guide. Applying for a home loan is the first step to take when getting serious about buying a home. It will help you understand how much house you truly can afford. Get ready for the application process by gathering your financial info, finding a lender to work with, and getting pre-approved. You can always shop around and pick another lender once you get an accepted offer. Mortgage loan pre-approval means approaching a lender with financial, credit, debt, and other information that will help them determine if you qualify for a loan at a certain amount. This article will give you an idea of how to get pre-approved for a mortgage and why pre-approval is important for buying a home. Credit Information: Your credit score and reports will determine the size of loan you may qualify for and the type of financing plan you will be offered. For example, a borrower with a credit score below 740 will usually have a higher interest rate associated with their loan. A borrower with a score below 580 will usually have to put down a higher down payment. Pro Tip: Check your credit score for free with credit.com. Debt Information: Gather and prepare any of your debt obligations. This includes student loans automobile loans, and credit card payments. Pro Tip: If you have a significant amount of debt, the amount that you’re pre-approved will likely be smaller or rejected. Before applying for your pre-approved mortgage, try paying off your debts and minimize the number of new debts you take on. Income Information: Gather and prepare income information from the previous two years. This includes tax returns, W-9s, pay stubs, and additional income information (from second jobs, overtime pay, social security payments, alimony or child support payments, etc.). Asset Information: Asset information refers to assets you own other than your income. This involves gathering bank statements, property statements, investment information, and money received by family members. Personal Information: Bring a personal ID such as a driver’s license or passport and your social security number to your lender’s office. Employment Information: This includes your proof of employment and the length of time you’ve been with your employer. Budget Information: Before going to see a lender, determine your budget for buying a new home. Pro Tip: Your total housing payment budget should not exceed 35% of your pre-tax income. The ideal percentage is 25% of your pre-tax income. There are two types of lenders you can work with (1) big lenders (aka the bank) or (2) small lenders (aka small, community banks or small mortgage lenders). Security: You can trust that big banks will protect your sensitive information as it’s a crucial part of their reputation. Customer support: Banks usually offer 24/7 customer support. Availability: Making an appointment for a loan will be easier with big banks as they have a larger number of loan officers available. Rates: The rates of the big banks are usually higher than the rates at small loan offices. Rates: Small lenders tend to have better rates than the big banks. Furthermore, smaller lenders generally let their customers exit early. In other words, small lenders allow their customers to pay off their mortgage early and either sell their house or find a better mortgage. Approval: Small lenders will generally approve loans to freelance workers, property investors, or someone who doesn’t fit the bank’s credit model. Customer Service: Small lenders provide more personalized customer service and usually have faster response times. Specialized Financing: Smaller lenders offer more specialized financing options than big banks. For example, if you’re looking for a small mortgage, most big banks won’t accept your application because it’s not worth their time. The smaller lender, however, will be happy to work with you. Vulnerability: Due to their size, small lenders are more sensitive to market fluctuations. Availability: Smaller lenders may not have as many available lenders as the big banks. Should I get pre-approved by multiple financial institutions to compare rates? Yes, because you can still shop rates before locking into a rate and accepting an offer. Research different lender’s reputation, search for their past clients, read their online reviews, and give them a call to get a ‘feel’ of whether or not you want to work with them. 1. How do I get pre-approved for a mortgage? Gather Documents: Gather the necessary documents (as listed in step 1). Organize Documents: Create a Google Drive or Dropbox where you can organize all information in one, easily-accessible place. Contact a Lender: Call, go online or visit a loan office/bank. The loan officer will review your documents and give you a preliminary estimate of how much house you can afford, your monthly mortgage payments, and mortgage interest rate. Find out if you’ve been pre-approved: You will receive a pre-approval letter that secures your interest rates for the next 90-120 days (more on this below). On the other hand, your lender will notify you that you have not been pre-approved. 2. Why get pre-approved for a mortgage? Accurate: The best pre-approvals will give you an accurate idea of how much house you can afford. Furthermore, you’ll get an idea of your monthly mortgage payments and your short-term mortgage interest rates. Protection: When you apply for a mortgage pre-approval, there is usually a 90-120 day protection against rising rates. In other words, pre-approvals lock-in interest rates and allow you to search for a home without worrying about interest rates increasing significantly. Trustworthy: A pre-approved mortgage signals to sellers and real estate agents that you’re serious about buying a home. Advantage: A pre-approved mortgage may be the deciding factor between you getting a home over another home buyer. Free: Getting pre-approved for a mortgage is free, and there is no obligation to use the lender that pre-approved your mortgage. 3. What is the difference between pre-qualification and pre-approval? Pre-qualification: During the pre-qualification stage of securing a mortgage, a lender will interview you to determine your income, expenses, and assets. The purpose of getting pre-qualified is to give you a rough estimate of how much house you can afford. Pre-approval: During the pre-approval stage of securing a mortgage a lender will look through your income, expenses, and asset more thoroughly. A pre-approval is a more concrete estimate of how much house you can afford. 4. What if I don’t get pre-approved for a loan? Now what? If you don’t get pre-approved for a loan, your lender can tell you why you were rejected. Lenders can also offer advice of how to get approved in the future. Build Credit: If bad credit was the reason you aren’t pre-approved, then pay off your credit cards and try not to miss your debt payments for the next 6-12 months. Build Savings: Lenders usually want to see a significant amount of cash reserve in your savings account. Again, pay off your debts and try to save some money before applying for a pre-approval again. Build Income: If your lender says that you don’t make enough income for a certain loan amount, either try applying for a smaller loan or, if you’re married, ask for a joint-loan with your spouse. Build Employment History: Usually, lenders don’t like to see inconsistencies in employment history. Wait until you’ve been at the same job for two years before applying for a loan. 5. Does pre-approval guarantee a loan? Pre-approval does not guarantee a loan. It is only a review of your qualifications for how much you might be able to borrow. A buyer receives their pre-approval letters, searches for their dream home within their pre-approved amount, has their offer and financial structure accepted by the sellers, and then submits their proposal to the lender. The lender then reviews the proposal, the buyer’s finance details, and the details of the property. If everything goes smoothly (i.e., the home doesn’t look like a money pit), the buyer will be approved for a mortgage. However, the pre-approval letter alone does not guarantee a mortgage. 6. How long does it take to get pre-approved for a mortgage? Depending on who you’re working with, you can get pre-approved for a mortgage in minutes. Sometimes all it takes is a phone call. 7. What impact (if any) will this have on my credit? The short answer here is that it depends. As mentioned above, lenders will look at your credit score and history to determine if you’ll be pre-approved. These are called credit report inquiries. First-time home buyers usually don’t have to worry about inquires damaging their credit score. However, the more inquires your credit history shows, the more it can damage your credit score. Inquires hurt your score because it shows lenders that you could be doing something with your credit that puts you at risk. Once you’re pre-approved for a mortgage, you can start the process of searching for a home, within your pre-approved amount. 1. Application: The mortgage application involves submitting the documents outlined in step 1. 2. Loan estimate: The lender analyzes your financial information and produces a loan estimate. A loan estimate describes the details of your loan including the terms and the predicted costs associated with your loan. The loan estimate does not tell you if you have been approved for a loan. It simply estimates what your loan would look like if you’re approved and will help you determine if you would like to move forward with the mortgage application process. Time it takes: The law states that you must receive your loan estimate 3 days after submitting your mortgage application. 3. Open a file: Your file is submitted to a loan processor who analyzes your financial documentation and property information. The loan processor places all this information into a loan package that is to be submitted to the underwriter. 4. Loan underwriting: An underwriter analyzes your loan to determine the risk of approving your mortgage. Essentially, the underwriter is the key-decision maker and determines if you’re a good candidate for a loan based on the likelihood of you paying your mortgage each month. A. Assess: The underwriter assesses your risk by verifying that your credit, debt, income, and savings information is true. For example, they may call your employer to confirm that you do in fact work x amount of hours and are paid x amount of dollars. B. Appraise: This is where the underwriter determines if your desired property’s price is comparable to the prices of similar properties. The purpose of the appraisal is to determine if the money you would like to borrow matches the value of the home you would like to purchase. If the appraisal is less than the loan amount, the underwriter will usually disapprove the mortgage or suggest another loan amount. C. Approve or reject: The underwriter considers all this information and then approves or rejects your loan application. Pro Tip: The underwriting process generally takes longer and requires more documentation if you’re self-employed. 5. Mortgage Commitment: If the underwriter approves your loan, you are officially locked-into an interest rate. 6. Closing: This is the step in the home-buying process where you sign all the necessary documents to own the home officially. Posted on February 19, 2019 January 22, 2019 Categories 1st time buyers, Buy, buy a condo, buy a home, Buying a Home, buying real estate, FHA Loans, first time buyers, Great time to Buy, Home Loans, lending, Real Estate, The Caton Team, The Caton Team Realtors, when to buy, where to buyTags banking, bath remodel, bay area real estate, bay area real estate market, Belmont, berkshire hathaway home services, best realtors, bidding war, Buy, buy a condo, buy a home, buy real estate, caton, condo, drysdale, Home Loans, homes, house, how to stage, I need realtor, interest rates, invest, invest in real estate, Investing, kitchen remodel, lending, list a home for sale, loans, Menlo Park, Palo Alto, preparing a home for sale, prudential, Real Estate, real estate bidding, real estate bidding war, real estate investments, real estate market, Realtor, realtor team, realtors, Redwood City, remodel, rental, Sabrina C, sabrina caton, San Carlos, san francisco, san francisco peninsula real estate, san francisco real estate market, san jose, santa clara, Sell, sell a condo, sell a home, sell a house, sell real estate, sellers market, should I stage, silicon valley, silicon valley real estate, staging, sunnyvale, susan caton, The Caton Team, warren buffet, when should I list my house for sale, when to buy, when to sell, where is the real estate market goingLeave a comment on How to apply for a mortgage: Your 4-step guide. A new year means new goals. If home ownership is one of them – it’s time to make sure your credit is in check. Melinda Sineriz is a writer living in Bakersfield, CA. She writes about personal finance and real estate for several websites and businesses. Posted on January 29, 2019 January 22, 2019 Categories 1st time buyers, Buy, buy a condo, buy a home, buy real estate, Buying a Home, buying real estate, credit report, first time buyers, Home Loans, Managing Your Credit Score, Real Estate, The Caton Team, The Caton Team RealtorsTags banking, bath remodel, bay area real estate, bay area real estate market, Belmont, berkshire hathaway home services, best realtors, bidding war, Buy, buy a condo, buy a home, buy real estate, caton, condo, drysdale, Home Loans, homes, house, how to stage, I need realtor, interest rates, invest, invest in real estate, Investing, kitchen remodel, lending, list a home for sale, Menlo Park, Palo Alto, preparing a home for sale, prudential, Real Estate, real estate bidding, real estate bidding war, real estate investments, real estate market, Realtor, realtor team, realtors, Redwood City, remodel, rental, Sabrina C, sabrina caton, San Carlos, san francisco, san francisco peninsula real estate, san francisco real estate market, san jose, santa clara, Sell, sell a condo, sell a home, sell a house, sell real estate, sellers market, should I stage, silicon valley, silicon valley real estate, staging, sunnyvale, susan caton, The Caton Team, warren buffet, when should I list my house for sale, when to buy, when to sell, where is the real estate market goingLeave a comment on How Long Does It Take to Improve Your Credit Score Enough to Buy a Home? Whats the most important factor is Real Estate? Location Location Location. Del Monte is in a fantastic, well established & maintained neighborhood. This home has AC, forced air heat, LED lighting, dual pane windows & sliders, hardwood, vinyl, tile, carpet & laminate flooring. Spacious living/dining combo with fireplace & vaulted ceiling. Custom Craftsman Kitchen with electric glass cooktop/dual oven range, dishwasher, microwave & custom refrigerator – all overlooking the spacious back yard. Family Room with informal dinning. Play Fort, Greenhouse & Drought Tolerant plants makes landscaping a breeze. ALL APPLIANCES INCLUDE. 2 Car Garage w Laundry, Freezer, drink fridge. All this and 4 Bed with 2 Baths including Master Suite and private office. Close to schools, parks, shopping, 880, the Bridge, Facebook & Tesla. FULL Disclosure package available – CLEAN REPORTS! Excellent condition. Worth a look – 8213 Del Monte Ave in Newark is a well maintained home, with classic features in excellent condtion. We have a full disclosure package with home, pest and roof inspections available upon request. Contact The Caton Team with any questions. Winter, as you’ve surely heard, is coming—hard and fast. So why not ride it out in your very own home in the mountains, in a sweet place where the slopes are groomed, the air is clean, and après-ski bars are buzzing? While you’re at it, maybe chill for the summer too! Truth be told, you don’t have to be a second-generation reality TV star, tech titan, or trust-fund kid to live large in a great American ski town. And no, we’re not schussing you. You just need to know where to set your sights. Hint: It’s not on Aspen, Jackson, Park City, or any of the other snowy playgrounds of the 1%, where median home prices rival or even exceed the most expensive neighborhoods of San Fransisco or New York. But there are plenty of lower-key, way more inexpensive options around. In fact, just about half of America’s ski towns, as defined by realtor.com®, have a median home price under $300,000. 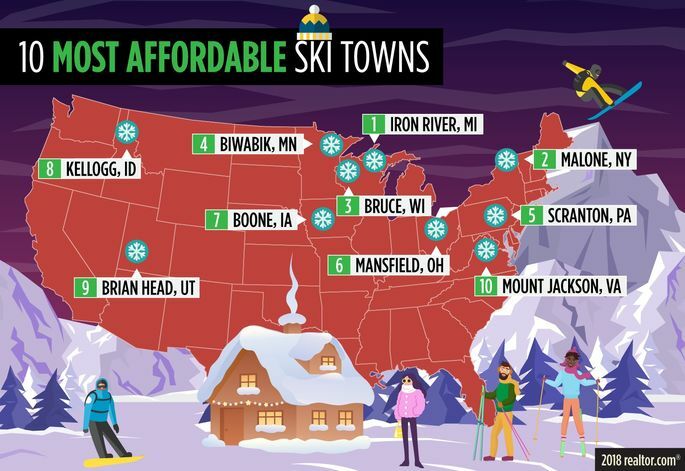 So our data team set out to find the most affordable of the bunch, towns where you can keep the dream of owning a home near the slopes alive, and maybe even have some cash left over for a new snowmobile. Or heck, an SUV! While you’d be forgoing some of the glam scenes, upper-end nightspots, and world-class powder of the best-known resort towns, these lower-priced mountain meccas are still undisputed winter and summer wonderlands. Some are old mining towns, or small remote cities that built resorts as a means to replace fading industries. They have fewer tourists, and miles of untrammeled nature. To create our rankings, we started with a list of around 450 ski resorts, as compiled by onthesnow.com, a website that creates snow reports for the ski industry. We then looked at median list prices in the nearest towns or cities to those resorts to figure out which had the least expensive real estate. Only places with at least 50 homes for sale in October were included, and for geographic diversity, we included just one place per state. So pull on that discount Uniqlo parka, grab a hot toddy or three, and let’s check out the best bargain ski towns in America. First-time buyer surveys consistently show the top hurdle to homeownership is saving up for the down payment. But potential home shoppers may be misunderstanding the amount of money they really need to buy a home. Several assistance programs exist to help buyers with down payment concerns break into homeownership. For example, 69 percent of about 2,500 homebuying programs tracked by Down Payment Resource offer down payment assistance. The average amount of assistance from these programs tops $11,000. HouseLogic offers several places where buyers can search for down payment assistance, including through national government programs. The Federal Housing Administration offers loans to first-time buyers with down payments as low as 3.5 percent. Programs like the USDA Rural Development Loans and VA Home Loans offer eligible buyers zero down payment loans. Mortgage financing giants Fannie Mae and Freddie Mac offer eligible buyers loans where they can put down as little as 3 percent of the purchase price. When buyers put down less than 20 percent, they pay private mortgage insurance each month to protect the lender’s interest. Many state and local homebuying programs offer assistance programs too. There are many different forms of assistance, such as forgivable loans and grants (gifts for some or all of the down payment and closing costs) to soft mortgages (down payment assistance loans that are deferred for some period of time based on the program’s requirements). To find a program, HouseLogic recommends NeighborWorks, which provides housing counselors to discuss mortgage options for free, and the Down Payment Resource, where buyers can check their eligibility for assistance programs. Mortgage brokers should also be able to supply buyers with information about programs in their area and help determine eligibility. Read the full scope of your buyers’ options and share the available resources for down payments—or no down payments—on HouseLogic. A lot of buyers, especially first-timers, worry about whether or not they’re going about their home search the right way. On the one hand, buyers fret that if they find their “dream home” too early, they might be missing out on something better. But, on the other, if the process takes a while, they worry that they’ll never find a home that works for them. The FOMO is real. Keep reading to find out if you’re on track with your home search and what you should do if you find that you need to go back to the drawing board. How many homes should you see? Honestly, that depends. While we understand the impulse to try and rely on hard-and-fast statistics, homebuying is a truly personal experience rather than a science. Trust your intuition. You know your needs, likes, and dislikes better than anyone else. You’ll know when you’ve landed on the property that makes the most sense for you to call home. If you’ve been looking for a while and haven’t really found anything that meets your needs, it might be time to redefine search criteria. Sit down and take some time to think about which features you really need to have in your new home versus which are more nice-to-have, wishlist items. Sometimes, narrowing search criteria can get tricky. If you’re unsure of where to start, try using the following as a starting point. Focusing in on a particular area is one of the easiest ways to refine your search. You can start by doing research into different neighborhoods by you. Think about what you commute to work will look like, if the area has amenities that you enjoy, the quality of the school district, and home values. With that in mind, though, you getting too hung up on a particular zip code can also limit your criteria. The key is keep an ideal location in mind while still staying open to possibility. When searching for a house, you should have a firm idea of how many bedrooms and bathrooms you’re after. Whether you’re just looking to accommodate yourself and the occasional guest, are thinking about starting a family in the near future, or want the option to convert a spare bedroom into an office, this information will surely help narrow your search. We advise against compromising on this feature because, while it is possible to put an addition on later, doing so takes a substantial amount of time and effort. More often than not, homeowners find that they would rather put their home on the market than go through the hassle of trying to renovate it to fit their changing needs. This is the big one. Once you have the above two details settled, it’s time to narrow your search results further to only those homes that you can truly afford. If you’ve already applied for a pre-approval, that number can be a good place to start. However, remember that a pre-approval shows the maximum amount that you can ask for in a loan. You may not want to borrow up to that amount once you factor in the rest of your monthly expenses. To find a more comfortable sale price, we recommend using a mortgage calculator to get a sense of what your monthly payment could look like at various loan amounts and interest rates. Then, once you’ve landed on a number that works for you, try plugging that into your monthly budget to get a sense of how the payment will feel in addition to your other costs. The good news is that once you’ve narrowed your search down, your pool of available properties will likely be much smaller than it was before – and much more targeted to meet your needs. From here, your search will be about zeroing in on your perfect match on the basis of which property was the best fit for your personal tates. You’ll know when a property feels like it could become home versus when you’d be trying to make the best of an imperfect situation. Keep hunting until you find the former. Posted on November 28, 2018 January 17, 2019 Categories 1st time buyers, Buy, buy a condo, buy a home, buy real estate, buy vs rent, Buying a Home, buying real estate, first time buyers, Great time to Buy, Real Estate, The Caton Team, The Caton Team Realtors, when to buy, where to buyTags banking, bath remodel, bay area real estate, bay area real estate market, Belmont, berkshire hathaway home services, best realtors, bidding war, Buy, buy a condo, buy a home, buy real estate, caton, condo, drysdale, Home Loans, homes, house, how to stage, I need realtor, interest rates, invest, invest in real estate, Investing, kitchen remodel, lending, list a home for sale, Menlo Park, Palo Alto, preparing a home for sale, prudential, Real Estate, real estate bidding, real estate bidding war, real estate investments, real estate market, Realtor, realtor team, realtors, Redwood City, remodel, rental, Sabrina C, sabrina caton, San Carlos, san francisco, san francisco peninsula real estate, san francisco real estate market, san jose, santa clara, Sell, sell a condo, sell a home, sell a house, sell real estate, sellers market, should I stage, silicon valley, silicon valley real estate, staging, sunnyvale, susan caton, The Caton Team, warren buffet, when should I list my house for sale, when to buy, when to sell, where is the real estate market goingLeave a comment on House hunting for first-time homebuyers: is there a right way? I’m on hold at the moment. Waiting to hear how many offers are coming in on my clients dream home. Wondering if we offered enough. Oh the joys of Real Estate in the Silicon Valley. This isn’t the first time I’ve waited on hold, nor the last. Though this is the first time I’ve waited long enough to start a blog post – so that tells you something. Tenacity. I’m not hanging up until I know. You see, once I find out where we stand, I can call my clients and update our strategy. Because it isn’t over until it’s over – and if we’re not the best offer – well gosh darn it – we will be. Or try to be. – I know Yoda – there is no try. But I tell you – it doesn’t hurt to try. … As soon as the lovely agent concierge gives me the latest news. I am so proud to say – that in 2017 – sellers left money on the table to work with The Caton Team buying clients. That says something. Furthermore, there were no side deals, no commission re-negotiations, nothing but a good clean offer and our Caton Team offer package. Because The Caton Team knows what it takes – good old fashioned hard work. Because when I say – sellers left money on the table – I mean – our buyers didn’t offer the most money for property in Silicon Valley – BUT – we had the best offer package and the hustle to ensure – we will close escrow. That’s the name of the game. You can offer all the money in the world and it doesn’t mean a thing if it doesn’t close escrow. As my mother always told me. Talk is cheap. It’s all about the action. Her words ring true today. I’ve been a Realtor for a lucky 15 years now, Susan for 20. However in the past decade give or take, Real Estate has changed dramatically. In fact, the past 5 years have been a revolution if you’ve been in the thick of it. I was able to see how the internet – wait – mobile devices – single handedly changed everything. It’s amazing. Do people still need Realtors? Or is there an App for that? In my humble opinion, the answer is YES, professional Realtors are still needed, relevant and imperative – especially in the Silicon Valley Real Estate Market. As long as we are human, making one of the largest financial decisions in our lives, and for as many algorithms and apps with data we have – there are some things you cannot replicate. Experience, knowledge and the ability to navigate a contract in a market that moves so damn fast. Not every Realtor is the same mind you. I’m speaking on behalf of myself, Susan and a bountiful handful of awesome Realtors who get it. We offer so much more than just opening a door. There’s an app for that – what The Caton Team brings to the table is knowledge, experience, negotiations skills that turn our buyers into homeowners. The Silicon Valley Real Estate Market is on par with New York now as one of the hottest Real Estate Markets in America and it also happens to be in our back yard. Though this post was dedicated to our Buying clients in this hot market – Selling a home is just as challenging. It’s not just putting a sign in the yard or a link on the net. Alas – that’s a blog for another day. Because…. …I’m off hold – so it’s back to work!